Montgomery Public Schools: The lesbians are coming? The lesbians are coming! 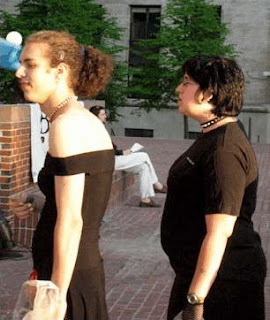 Young man on left is led around by woman with chain at recent gay event. filed by Citizens for a Responsible Curriculum, www.mcpscurriculum.com, Family Leader Network and Parents and Friends of Ex-Gays (PFOX). Ryan P. Phair, Daniel H. Squire, Jonathan J. Frankel, Kenny A. Wright, Daniel J. Matheson, Brian M. Simmonds are the attorneys from Wilmer Cutler who will fight against the parents and ex-gays suing Weast and the Board. When confronted with this development, a CRC representative stated that its not unusual for large world wide law firms to take both side of social issues, especially when the case is likely to end up at the Supreme Court. Usually two large law firms square off, so that its evenly matched. Judges prefer an even playing field. However, when CRC and PFOX have approached large law firms they have been quietly told that no large law firm will take on the gay agenda. The large firms are terrified of the bullying tactics of gays at Ivy League law schools when they attempt to recruit new attorneys. Like the Nazis of 1930s Germany a small but vocal group of gays intimidate large law firms with bully tactics. Ex-gays describe the gay movement as a cult, that recruits, and then punishes anyone who tries to escape or resist them. John Garza, the Rockville attorney for CRC, Family Leader Network and PFOX stated that he “knows who wins in the end,” that bully tactics, hate, intolerance of religious people, and spreading lies will keep the large law firm from future success. “Like Hitler and his thugs, the gay agenda will have its day and then, good will triumph over evil” Garza said. At a recent gay protest, lesbians were heard chanting “We may not go down in history, but we will go down on your sister.” We think Misters Wilmer, Cutler, Pickering, Hale and Dorr are turning in their grave. What power the lesbians have in MoCo. Stay turned, its not getting pretty.